This book deals with the study of the case of the Propaganda Department of the Jewish National Fund in Israel during the years 1924-1947. It treats the intersection between propaganda and the education of children and youth through the development of mass media work practices – an encounter which took place on the background of the need of the organization (the JNF) to achieve political goals over a long period of time. The JNF (sometimes referred to as the KKL – Keren Kayemet Le Yisrael – the Hebrew transliteration) is the executive body established by the Zionist m ovement in 1902 to buy land in Palestine for the Jewish people. Very quickly, however, it became an international organization and, even, before World War I had branches in many countries throughout the world. One of the tasks of these branches was to mediate between the central office in Jerusalem and the millions of Jews who donated money to buy land. 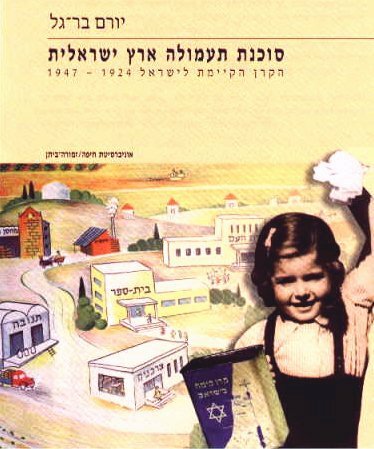 The organization , which is still active throughout the Jewish world, concerned itself with “the marketing of ideology”: the dissemination of symbols, knowledge and ideas to the masses of the Jewish people, and converted them into money and real estate property in the Land of Israel – Eretz Yisrael. While the history of Zionism will remember the JNF as an organization which purchased land for the settlement of Jews in Eretz Yisrael, in the memories of much of World Jewry the organization is linked with the memories of their childhood and the forming of their identities. This memory was, in fact, fashioned by the Propaganda Department of the JNF which worked through the mass communications media in the Jewish world and made its presence massively felt in the Jewish education networks in many countries. Up until today there has been virtually no research carried out on these aspects of Zionist propaganda which helped fashion the collective memory and left its mark upon Jewish culture in Israel and the Jewish Diaspora. The documents of the period under study allow us to study the institutional motive of the JNF which propelled it towards the intensive activity whose results were felt by every child who received a Zionist education. The JNF devoted considerable resources to this activity and one can assume that the motives were connected to areas of politics and internal-Zionistic struggles for power. The study identifies a small group of people, from the areas of both propaganda and education, who saw Eretz Yisrael as the ‘product’ they had to market to various sections of population within the Jewish World, using the conventional methods of persuasion for those days. The use of the term “propaganda”, which will constantly appear in this book, has been an emotionally loaded concept since the Second World War. The term “propaganda” is, actually, one of the expressions of the art of “persuasion”: that is an organizational or institutional effort to persuade others to believe (or not to believe) in “certain truths” or to carry out (or avoid carrying out) certain activities. There are those who define propaganda as “a form of communication which attempts to change the attitudes and beliefs of others” “thus giving it a common basis with other forms of “mass persuasion” such as” “education” or “advertising and public relations.” At the beginning of the twentieth century “propaganda” became one of the accepted means of propagating doctrines and ideas, mainly because of the influence of the development of the means of communication, beginning with written and photographic journalism, through the cinema and including radio broadcasting. Since the First World War “means of propaganda” have been used widely by organizations such as independent states or political movements, and this reached its climax in the totalitarian and fascist regimes which followed several years later. In these regimes (such as the Soviet regime or the regime in Nazi Germany) there were no clear distinctions between “propaganda” and “education” since both were directed towards specific goals and left the individual no “freedom of opinion.” As a result the expression “propaganda” received a negative connotation. The JNF people who, between the world wars, worked and grew up in those same European countries, absorbed the concepts and ideas which were born and fashioned during that period. For them the term “propaganda’ was not understood as a negative term at all, but as a positive term – and they used it widely. They believed that they could persuade the masses of the Jewish People to donate money to purchase national land in Eretz Yisrael. The application, which arose out of this basic belief, they called “means of propaganda” and the methods of its dissemination “propaganda work.” They combined this idea with the educational world view which was dominant in Zionist educational institutions. From the point of view of those who worked during those years in the Propaganda Department of the JNF the argument over the border between “education” and “propaganda” is anachronistic. Thus, as will be pointed out in other parts of the book, for these people “the ends justified the means.” Their involvement in both formal and informal education was great in their attempt to gain organizational advantages with the assistance of the education system. The JNF staff succeeded in creating the feeling in the Zionist public that “what was good for their organization was good for the nation.” They operated a wide-ranging international organization for a long period of time, they created personal life experiences and fashioned common cultural concepts which became part of the lives of millions throughout the Jewish world. The members of this department created a language of their own, wrapped the children and youth in a myriad of images, activated them in weekly and annual rituals and, thus, strengthened the myths which were created during that time. The first layer presents different historical overviews of the Jewish National Fund which touch upon the many questions which form the background of the research. In this section events from 1924-1947, to which the JNF had to respond through various means of propaganda, will be described and the principles which guided the organization in its propaganda work throughout the period studied will be discussed. This propaganda work was aided by the special organizational structure which was characterized by a mutual relationship between the center in Jerusalem and the different branches in the Jewish Diaspora in the USA, Great Britain, Poland, Germany and so on. Of all the many means of propaganda produced by the JNF we have chosen to present those they considered to be most important for the second layer. Each of them is presented in a separate section and demonstrates different types of propaganda, some direct and others indirect. The first group of propaganda means they called “means for collecting money, “ which quickly turned into conventional propaganda. Amongst them were the “Blue Box” – the flagship of the organization and the stamps which were miniature posters making political declarations and which were distributed to adult and schools; we will focus on these. Other varied forms of propaganda addressed youth and children – books, games and song books. These things served the propaganda through the education network and not for the purposes of collecting money. Another organizational effort was linked to printed propaganda which led to the publication of about a hundred semi-scientific monographs. The disclosure of the editing process of the monographs reveal how heavy handed the socio-political censorship imposed on the JNF’s publications was. It must be noted that during that same period the JNF propaganda/education staff exploited the technologic advances of the visual mass media for their purposes and a separate chapter will be devoted to this. The main visual propaganda was done through means which were cheap asimple to operate such as short films and photo slides. Following a review of the issues concerning the production of visual propaganda we will concentrate mainly on the short films and the propaganda lectures which accompanied them. a) JNF rituals. This means the methods the organization produced to instill the idea of contribution to it through the development of different ceremonies and festivals in the Hebrew education network. These became part of the annual routine of schools and acted as a foundation for ceremonies still carried out up till today in Israel’s education system. b) Propaganda in maps. The map of Eretz Yisrael which appeared on the “blue box” and on publications was, to all intents and purposes, a propaganda map and declared specific political positions. The intention of propaganda can be explained on the background of different challenges in the political struggle of that period: the division of Palestine between the Jews and the Arabs. c) Ideal images of the landscape. The descriptions of the landscape of Eretz Yisrael which the JNF distributed became an inseparable part of Zionist symbolism. We will deal with a number of images from the creative workshop of the Propaganda Department of the JNF, and we will indicate the importance of the editorial and censorial mechanism used in producing these images. d) The target audience. According to the inter-disciplinary approach, the book touches upon several areas; propaganda and the mass media, formal and informal education, the interpretation of landscape and, of course, Jewish and Zionist history. Accordingly it seems that the book should be of interest to a wide audience from different areas, and it has been written with such an audience in mind and not only for the limited public of the learned. Thus the book’s text is accompanied by graphic material and archival documents which visually illustrate and make concrete the theories and textual analyses. 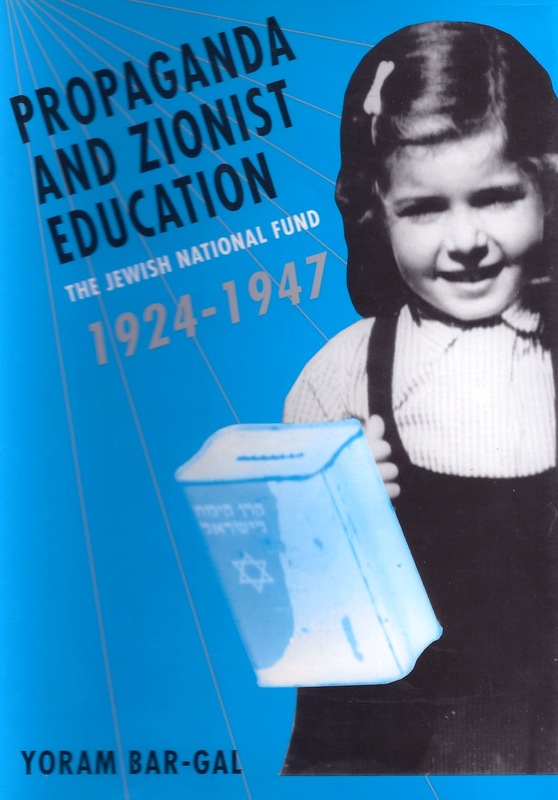 Professor Bar-Gal’s book, “An Agent of Zionist ropaganda: The Jewish National Fund 1924-1947,” questions how the JNF became so involved in our culture, and also examines the less savory aspects of its activities. The blue box was of course the flagship, and on one poster it even peered out from next to the Sabbath candles as an inalienable part of Jewish identity. The blue box, it turns out, was the Zionist equivalent of the charity collection boxes that were customary in synagogues. The first proposal to put such a box in every public institution came from a bank clerk in Galicia named Haim Kleinman in a letter to the Zionist newspaper Die Welt in 1902. The JNF attributed the innovation to the organization’s founder, Haim Shapira. (The JNF was established in 1901.) The artistic design of the box over the years became an ideological tool. In 1922 a design competition was held, which was won by Eliezer Streich, an art teacher at the Reali School in Haifa. The design he proposed was very colorful, and included a picture of a farmer plowing his land, decorations resembling the roof of the Temple and arched windows. For reasons of cost, it was decided not to use the winning design and to produce simple boxes with a map of the land of Israel on them. Menachem Ussishkin, who headed the JNF, preferred not to give up the ideology of the greater land of Israel, and therefore no eastern border was drawn on the map. The white area, stretching from the front to the sides, hints to anyone interested in reading it that way, that the map includes Trans-Jordan. This is the box still used by Jewish organizations around the world, apart from in the United States, where they use a box that is turquoise green in color, adorned with a picture of a hand planting a sapling. “At the end of the 1980s, the JNF received a sizable donation from an American woman, who stipulated that the money be invested only beyond the Green Line. The JNF refused, and the woman took it to court claiming that the drawing of the map on the box was misleading and created the illusion that contributions are invested on both sides of the Green Line. The judge forced the JNF to compromise, and therefore the map was taken off the boxes, “explains Bar-Gal. The involvement of the JNF in Hebrew films began in 1921, when it acquired the rights to the film Return to Zion” from Ya’akov Ben Dov, added scenes to it and marketed it under the title “Renewing the Land of Israel.” Despite its great success, the JNF offices here received critical letters, among them one from New York complaining that “It is hard for your film to compete with Charles Tshaplin and other film greats.” The writer, of course, meant Charlie Chaplin. In 1923, Ben Dov produced a film especially for the JNF, “The Awakening Land of Israel,” which follows the travels of a Jewish tourist in the land of Israel. Between the scenes, animations of coins making their way to the collection box were inserted. After the screenings, of course, a collection was taken. to lands but served an educational mission only.